Late last week the Yankees announced their list of non-roster invitees to Spring Training, a list that runs 20 players deep and includes top prospects like Estevan Florial and Justus Sheffield. It also includes journeymen like Danny Espinosa and Dave Hale. Non-roster players are always a mix of exciting youngsters and veteran retreads. Same story every year. Given the sheer volume of players invited to big league camp each year — 20 is actually on the low side, there’s usually 24-26 invitees to Spring Training — there are bound to be some surprises. Players who weren’t necessarily expected to be in camp as non-roster players, but will in fact be there, even if only for a few weeks. Based on the last few years, these surprise players are players the Yankees like more than I realized. So, with that in mind, here are the three biggest surprise invitees to Spring Training, at least in my opinion. I previewed potential non-roster invitees a few weeks ago and nailed 17 of the 20 players coming to camp. These were the three I missed. The Yankees have an enviable stable of hard-throwing righthanders, and Coshow has touched 100 mph with his fastball. He couples the pitch with a slider that will flash 55-grade on the 20-to-80 scouting scale. He’s big, strong guy at 6-foot-5, 270 pounds, but his delivery is pretty clean too. Last season, at mostly Double-A Trenton, Coshow had a 3.75 ERA (2.97 FIP) with 27.6% strikeouts and 7.6% walks in 60 innings. It was his third straight season spending time at the level, though he did make four late-season appearances with Triple-A Scranton. Coshow is fairly far down the righty reliever depth chart, or at least I thought so until he got a Spring Training invite. The Yankees aren’t bringing him to camp out of the kindness of their hearts. They think he has a chance to help as soon as this year, and they want the coaching staff to get to know him.
? Espinal is low-to-mid-90s with his fastball out of the bullpen and he also has the makings of a good slider. There’s a little bit of Ivan Nova in his delivery given the long arm action in the back. Nova always suffered from a lack of deception. He had really good stuff, but hitters got a good look at the ball, and the results weren’t always there. I wonder if Espinal will have similar problems with upper level hitters. Clearly, the Yankees like Espinal enough to bring him to camp as a non-roster player, even if he’s only there for a few weeks and is among the first players sent down. They like something about him and want to see more. Espinal isn’t young in prospect years and he’s only had one good year in his career. Still, that was enough to get him an invite to Spring Training. The Yankees won’t care how old he is if he can get big leaguers out. Perhaps I shouldn’t be surprised Widener is getting an invite to camp. He is one of the better pitching prospects in the organization — Keith Law (subs. req’d) ranked him as the 15th best prospect in the system last week, for what it’s worth — and that alone usually equals a Spring Training invite. I thought two things would hold him back. One, Widener has only been a full-time starter for one season. And two, he has basically zero experience above Single-A. Given the overall pitching depth in the farm system (especially at the upper levels) as well as Widener’s own developmental needs, it is extremely unlikely he will pitch in the big leagues this season. The same was true of Justus Sheffield last season, but he got a Spring Training invite anyway, mostly because the Yankees wanted to challenge him against quality hitters and give him a chance to work with the big league coaching staff. It’s a development opportunity more than a reward for being a top prospect. It goes without saying Widener is not the same caliber of prospect as Sheffield last season, but the same principles apply. The Yankees will challenge him with some outings against big league hitters — big league hitters in the middle of their spring routine, but still big league hitters — and also have him work with Larry Rothschild and the other big league coaches. They see him as a potential big league option down the road, and an invite now is part of the journey. Usually when I put this post together each spring, I include three notable players who are not coming to big league camp, but there aren’t any this season. Pretty much everyone I expected to be there will be there. The most notable omission is probably lefty Stephen Tarpley, who had a great minor season last year (0.88 ERA, 2.85 FIP, 26.9 K%, 11.5 BB% in 41 innings), but he was passed over in the Rule 5 Draft and it’s unclear if he has the control or breaking ball to succeed at the next level. I thought he’d get invited to camp. He wasn’t. Not a huge deal. For the most part, the most exciting young players who will be in Spring Training this year are already on the 40-man roster. That group includes Gleyber Torres, Miguel Andujar, Domingo Acevedo, Albert Abreu, and Jonathan Loaisiga. It’s really unlikely Abreu and Loaisiga will pitch in the big leagues this season, but Acevedo might, and of course Torres and Andujar will compete for starting infield jobs in camp. Coshow, Espinal, and Widener will be fun to watch in their on way. The 40-man roster prospects are where it’ll really be at. As a reminder, all players on the 40-man roster will be in big league camp automatically. That includes top prospects like Gleyber Torres, Miguel Andujar, Domingo Acevedo, Albert Abreu, and Thairo Estrada. Ditto the no longer prospect eligible Clint Frazier. The 40-man roster is full, so the Yankees will have 60 players in camp total. Hale, Kratz, Espinosa, and Peterson all signed minor league contracts in recent weeks. Everyone else is a product of the farm system. The only real surprise is Espinal, a 26-year-old righty who had an unreal minor league season a year ago, throwing 74.1 relief innings with a 1.09 ERA (2.23 FIP) and great strikeout (33.5%) and walk (5.4%) rates. He topped out at Double-A Trenton. Seems like Espinal impressed enough to get an invite to camp. Good for him. Assuming everyone stays healthy and there are no surprise trades, the Yankees have three Opening Day roster spots available: second base, third base, and last bullpen spot. I imagine the out of options Chasen Shreve has a leg up on the final bullpen spot. Torres, Andujar, Estrada, Espinosa, Peterson, Ronald Torreyes, and Tyler Wade are the primary competitors for the second and third base jobs. When I put together my non-roster players preview a few weeks ago, I came up with 20 names. Espinal, Widener, and Coshow were the only actual non-roster players I missed. They take the place of Stephen Tarpley, James Reeves, and mystery first baseman yet to be signed on my projected non-roster list. Not too shabby on my part. 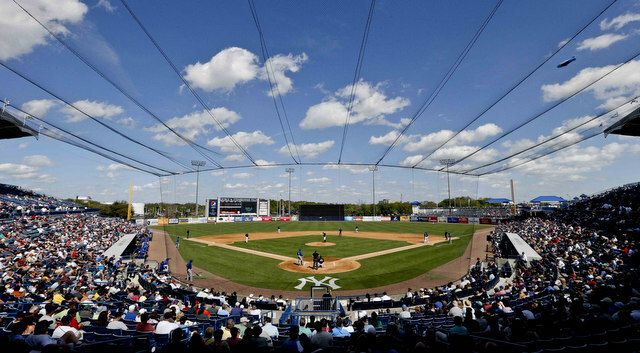 Pitchers and catchers report to Tampa three weeks from tomorrow, and at some point soon, likely within the next two weeks, the Yankees will announce their 2018 Spring Training invitees. These are non-40-man roster players who get a chance to come to big league camp to strut their stuff. Some non-roster invitees are top prospects, some are middling prospects, and some are veteran journeymen trying to hang on. Generally speaking, teams bring 20-25 non-roster players to Spring Training each year. Last year the Yankees initially invited 23 non-roster players before adding a few more within the first few days of camp. It was a World Baseball Classic year, so they needed extra bodies around while guys were away playing for their country. This is a normal year though, so 20-25 non-roster players. That sounds about right. The Yankees still have a strong farm system despite the recent trades and graduations, and many of their top prospects are already on the 40-man roster, so they’ll be in camp automatically. Four of MLB.com’s top seven Yankees prospects are on the 40-man, so yeah. Spring Training is a great time to prospect watch. We’ll get a chance to see pretty much all the team’s best prospects at some point, 40-man roster or otherwise. So, with Spring Training inching closer and non-roster invitees soon to be announced, now is a good time to preview the non-40-man roster players the Yankees could bring to camp this year. Last year I predicted 24 non-roster players and 20 of the 24 actually got the call, so go me. Hopefully I’ll have a similar success rate this year. Anyway, let’s get to the potential non-roster players. Every team brings lots of catchers to Spring Training each year because hey, who is supposed to catch all those bullpen sessions? That’s really all there is to it. There are lots of pitchers in camp who need regular work to get up to speed, and teams can’t overload three or four catchers early in camp. Imagine making Gary Sanchez squat four hours a day to catch bullpens before games even start? Nope. Not gonna happen. The Yankees will again bring plenty of non-roster catchers to camp. My Prediction: Francisco Diaz, Erik Kratz, Chace Numata, Jorge Saez. Kratz re-signed on a minor league deal a few weeks ago and as a big league veteran who spent September with the Yankees and traveled with the team in the postseason, it’s safe to assume he’ll be in camp as a non-roster player. Diaz and Saez are organizational depth catchers who were in camp last year. (Diaz re-signed as a minor league free agent earlier this winter.) The Yankees picked up Numata a few weeks ago and given the fact he has Double-A experience, it makes sense that he’d get the call for Spring Training. Sanchez, Austin Romine, and Kyle Higashioka are on the 40-man, making it seven catchers total for Spring Training. The infield mix this spring should be pretty interesting. 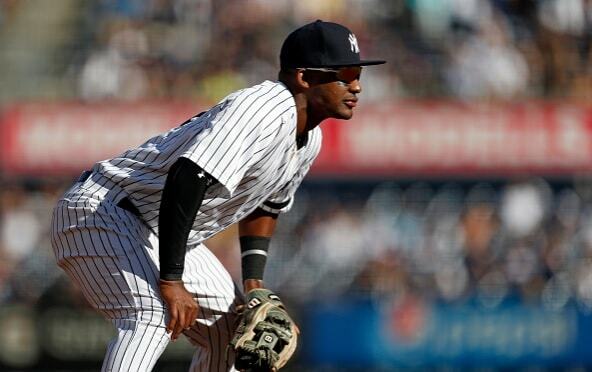 The Yankees have openings at second and third bases, and while youngsters like Gleyber Torres and Miguel Andujar may be the favorites for those jobs, I have to think the team will cover their bases and bring in plenty of options. Torres, Andujar, Tyler Wade, Thairo Estrada, and Ronald Torreyes are all on the 40-man already. Those are your top five second/third base candidates. On the prospect front, Nick Solak strikes me as a logical non-roster player given his status as a recent high draft pick (second round in 2016) and success at Double-A last season (.286/.344/.429 for a 112 wRC+), even though it came in a 30-game cameo. My hunch is Kyle Holder will get some non-roster time as well. He’s another recent high draft pick (supplemental first round in 2015) who had a good-ish year in 2017. The Yankees like him enough that they sent him to the Arizona Fall League. I think Holder gets the invite as basically the last infielder and is among the first cuts. Younger lower level infield prospects like Hoy Jun Park, Dermis Garcia, Diego Castillo, and Oswaldo Cabrera aren’t non-roster material. Big league camp isn’t the appropriate place for them at this point in their careers. The Yankees will, however, bring another first baseman to camp. Greg Bird and Tyler Austin are the only 40-man players at the position now. The Yankees tried to re-sign Ji-Man Choi, who recently signed with the Brewers. I imagine they’ll target another Triple-A first baseman. Looking at the list of free agents … maybe Tyler Moore? We’ll see. I also expect the Yankees to bring in another veteran infielder on a minor league deal. They’ve already signed Jace Peterson, but remember how many infield spots they have to fill. There’s second, third, and the backup spot at the MLB level. Then there’s second, third, short, and the backup spot in Triple-A. That’s seven infielders. Right now the Yankees have Torres, Andujar, Wade, Estrada, Torreyes, and Peterson for six of those seven spots. So yeah, another minor league contract infielder is coming. My Prediction: Holder, Solak, Peterson, an infielder yet to be signed, and a first baseman yet to be signed. If the Yankees don’t sign a first baseman — that would really surprise me, but I suppose it’s not impossible — Ryan McBroom would be the third Spring Training first baseman almost by default. Billy McKinney, who is on the 40-man and started playing first in the Arizona Fall League, also figures to see time at the position. Last year the Yankees invited two non-roster outfielders to camp: Clint Frazier and Dustin Fowler. Frazier, assuming he isn’t traded between now and reporting date, is on the 40-man and will be in camp automatically. Fowler is with the A’s. The Yankees are overloaded with outfielders at the moment, so they have more than enough bodies to cover all those innings during Grapefruit League play. Now, that said, the Yankees tend to bring their very best prospects to camp each season, which means Estevan Florial is a good bet to receive a non-roster invite. He went to the Futures Game last year, finished the season with a quick Double-A cameo, and went to the Arizona Fall League. And he is one of the 100 or so best prospects in baseball. Even though he turned only 20 in November, Florial is sufficiently top prospecty enough for a non-roster invite at this point of his career. My Prediction: Florial. That’s it. Other outfield prospects like Isiah Gilliam, Rashad Crawford, and Alex Palma are a no. Keep in mind the Yankees have nine outfielders on the 40-man at the moment: Frazier, McKinney, Jabari Blash, Jake Cave, Jacoby Ellsbury, Brett Gardner, Aaron Hicks, Aaron Judge, and Giancarlo Stanton. Peterson and Wade can also play the outfield. The Yankees are plenty covered. The Yankees have more high-end young pitching in the farm system than at any point in the last 10-15 years. One small problem: Most of it is in the low minors. Teenagers like Matt Sauer, Luis Medina, Roansy Contreras, and Deivi Garcia aren’t coming to big league camp. They don’t belong there. They’re not ready for it. Even the Single-A guys in their early-20s like Freicer Perez and Taylor Widener won’t get invited. It’s not their time. Clarke Schmidt, last year’s first round pick, is still rehabbing from Tommy John surgery, so he won’t get a non-roster invite. There’s no point. Even ruling out the generally inexperienced lower level guys, the Yankees have no shortage of quality right-handed pitching prospects to invite to camp. Chief among them: Chance Adams and Dillon Tate. Adams was in camp last season and could be the first guy called up when a sixth starter is needed this season, so of course he’s coming to camp. Tate was not a non-roster guy last year, but now that he has some Double-A time under his belt, it stands to reason he’ll get the invite. On the bullpen side, I think J.P. Feyereisen will return to big league camp this spring — he was in camp last year — even though he didn’t have a great 2017 season and was passed over in the Rule 5 Draft. He’s someone who could find himself in the big leagues rather quickly if he starts the season well and the Yankees have a need. The Yankees will want the new coaching staff to get to know him. Same with Cody Carroll, last year’s breakout relief prospect, who finished the season in Double-A and dominated in the Arizona Fall League. My Prediction: Adams, Carroll, Feyereisen, Tate, Brady Lail, and a minor league contract guy yet to be signed. I get the feeling a depth arm signing is coming. As for Lail, he was a non-roster player each of the last two years, so the Yankees like him. Maybe they don’t like him as much now after a tough Triple-A season last year (5.17 ERA and 4.76 FIP), but I’m going to play it safe and say he gets another invite. There are always innings to be soaked up. Reminder: Albert Abreu, Domingo Acevedo, and Jonathan Loaisiga are all on the 40-man roster. They’ll be in camp. I’m looking forward to seeing Johnny Lasagna. Moreso than another other non-40-man prospect this spring. 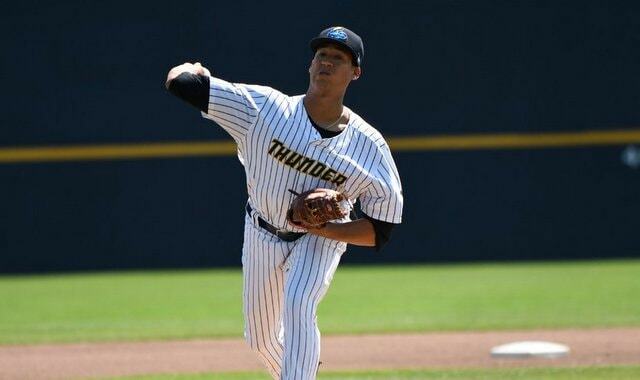 Realistically, there’s only one worthwhile left-handed pitching prospect in the organization: Justus Sheffield. Sheffield is the Yankees’ top pitching prospect overall and he was in camp as a non-roster player last year, so of course he’ll be back this year. He made only two appearances totaling 3.2 innings last spring. I’d bet on a little more action this time around.
? … the kind of profile that seems to be dying out around baseball, but the Yankees like him enough to bring him to camp last spring, and after he season he just had, I expect him to be back in big league camp this year. As for Tarpley, he had an unreal 2017 season, throwing 41 innings with a 0.88 ERA (2.85 FIP) and a strong strikeout rate (26.9%) but a not-so-strong walk rate (11.5%). The numbers are good, but Tarpley went unpicked in the Rule 5 Draft last month, and teams usually gobble up any left-hander they think has a chance to be useful. Hmmm. My Prediction: Sheffield, Reeves, Tarpley, and Wade LeBlanc. LeBlanc is on a minor league contract with an invite to camp, so he’ll be there. I think Tarpley gets an invite because the Yankees are short on 40-man roster lefties — the only southpaws on the 40-man are Aroldis Chapman, Jordan Montgomery, CC Sabathia, and Chasen Shreve — and clubs generally like to bring in plenty of lefties just to take inventory. See who could be an option at some point, you know? That’s probably not enough players. Last year the Yankees had 23 non-roster players initially before adding a few others during the first days of camp. They had 26 non-roster players in camp in both 2015 and 2016. My total of 20 potential non-roster players is light. There will be a few more players in camp. Like I said, the Yankees are almost certainly not done signing journeymen like Kratz, Peterson, and LeBlanc to minor league deals. The Yankees had five veterans (Choi, Jason Gurka, Ruben Tejada, Donovan Solano, Pete Kozma) on minor league deals in camp last spring, for reference. A few more signings are coming and will get the non-roster list over 20 names. Also, it’s entirely possible the Yankees will be more open to bringing lower level prospects to camp this spring. Maybe they let Donny Sands catch some bullpens, or give Park a taste of big league life, or let someone like Perez or Widener air it out for a few innings to showcase them as trade chips. Those 20 names above are the core non-roster players. A few minor minor league signings and a surprise prospect or two (like Daniel Camarena last year) figure to round out this year’s crop of invitees. The just turned 23-year-old Widener grew up outside Augusta in Aiken, South Carolina, where he won a variety of All-State and All-Regional honors at South Aiken High School. Baseball America ranked him as the seventh best prospect in the state and the 454th best prospect nationwide for the 2013 draft. Despite that, Widener went undrafted out of high school. He instead followed through on his commitment to South Carolina. Widener was Jordan Montgomery’s teammate during his freshman year with the Gamecocks — Montgomery was a junior in his draft year that season — and he threw 40.1 innings with a 1.79 ERA and a 38/15 K/BB. He also saw some action as a position player, hitting .191/.283/.191 in 54 plate appearances. That was the end of his time as a hitter. Widener was exclusively a pitcher after that. Back and knee trouble hampered Widener as a sophomore. He threw 32 innings with a 4.78 ERA and a 44/19 K/BB, and also saved nine games. Widener joined the Lexington County Blowfish of the Coastal Plains League after the season to make up for lost innings and was dominant, throwing 32 innings with a 2.53 ERA and a 43/7 K/BB. Baseball America ranked him the No. 2 prospect in the league. Widener had more injury problems prior to his junior season. He needed ulnar nerve transposition surgery on his elbow in the fall — that’s what Michael Fulmer had this offseason and Jacob deGrom had last offseason — and once he healed up, he threw 55 innings across nine starts and eight relief appearances for South Carolina. Widener finished the spring with a 4.20 ERA and a 68/16 K/BB. Baseball America ranked Widener as seventh best prospect in South Carolina and the 258th best prospect in the country prior to the 2016 draft. The Yankees selected him with their 12th round pick (368th overall) and signed him quickly for a straight slot $100,000 bonus. After signing, the Yankees had Widener jump straight to Short Season Staten Island, where he made six appearances before being bumped up to Low-A Charleston. All told Widener threw 38.1 innings with a 0.47 ERA (1.50 FIP) to go along with great strikeout (44.0%) and walk (5.2%) rates in his pro debut. He was outstanding. After that, the Yankees decided to make Widener a full-time starting pitcher. Last year, in his first full pro season, Widener spent the entire regular season with High-A Tampa, where he made 27 starts and threw 119.1 innings. He had a 3.39 ERA (3.05 FIP) with 26.4% strikeouts and 10.4% walks. Widener seemed to hit a bit of a wall at midseason, but he finished strong, strong enough that the Yankees moved him up to Double-A Trenton for the postseason. And in his first outing with Trenton, Widener struck out seven in five hitless and walkless innings to complete a combined no-hitter with Justus Sheffield.
? Next time out didn’t go so well. Widener allowed two runs on three hits and two walks in one inning in his second and final postseason appearance with the Thunder last September. Tough end to an otherwise fine first full pro season. Widener’s go-to secondary pitch is a hard and occasionally devastating mid-80s slider that is a true wipeout pitch on its best days. He’s still working to gain consistency with it, however. Widener didn’t have much of a changeup when he came to pro ball and the Yankees have been working him to develop the pitch. It was their top priority in Instructional League last fall.
? Widener stayed healthy last season but had some injury problems in college (knee, back, elbow), so he’s going to have to show he can stay healthy to make this rotation thing work. He’s a good athlete and he repeats his delivery, so that’s a plus, but even pitchers with good deliveries get hurt. That’s baseball. Between the college reliever-to-pro starter thing and being a 6-foot-0 right-hander, Widener draws inevitable comparisons to Chance Adams, though they’re unfair because Adams is more consistent with his slider and has a much better third pitch (curveball). Chance Adams is Chance Adams and Taylor Widener is Taylor Widener. They’re their own people. Widener is ticketed for Double-A this coming season. He had a good season at High-A last year and he pitched well overall during the Double-A postseason, so yeah, Trenton it is this year. 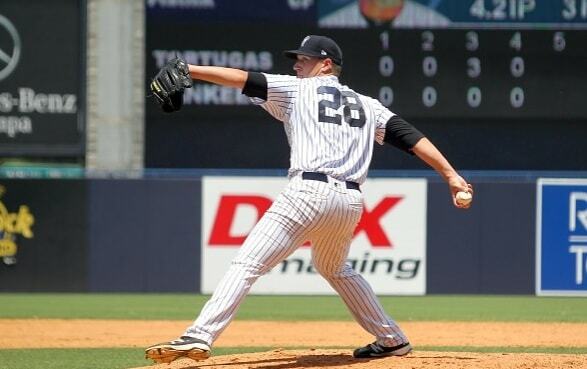 The Yankees had Widener focus on his changeup in Instructional League, which suggests they plan to keep him in the rotation for the time being. A smart move, that is. Widener held his stuff as a starter and there’s no reason to move him back to the bullpen yet. Let him keep working at it. I like Widener probably more than I should. As long as he stays healthy, I think he has a high likelihood of long-term success as a reliever with a chance to start. Keep in mind the guys the Yankees help add velocity tend to keep adding velocity. The increase usually takes place across two or three years before the pitcher reaches his max. Widener was 93-95 mph last year and could be closer to 95-97 mph this year. That’d be something. Like I said though, I think he has a good chance to carve out a career as a reliever if the whole rotation thing doesn’t work out.